I love sports! I loved playing them competitively, I enjoy playing them recreationally, and I have three little boys for whom I am their coach, their second biggest fan (can’t compete with mom), and often serve as the replay review booth for backyard disputes (takes some imagination but it works!). Therefore, I was excited to finally get a chance Lincoln Harvey‘s book on celebrating “sport for what it is without confusing it for what it isn’t” (xv), and I wasn’t disappointed. Harvey has written an excellent book, both easily readable and deeply informative. Over the next couple of days, I will offer some thoughts on the book but these posts are not meant to be a full review. Today will focus on two central ideas stemming from the book and tomorrow will ask one question about the book. With these basic ideas in mind, I want to draw attention to two ways Harvey helps us think about sports as Christians. First, sports is not worship. Although the two have a “strong family resemblance” (93), Harvey explains, “Worship is the liturgical celebration of who God is with us. Sport is the liturgical celebration of who we are by ourselves” (94). This distinction, which I will question somewhat in my next post, helps us to see one way sports is tainted by sin. Rather, than being a celebration of who we are as God’s “unnecessary but meaningful creation” sport can easily become self-worship. Harvey writes, “Because the Fall impacts our deepest identity, our playfulness is corrupted. Instead of being non-serious, we instead take ourselves too seriously, even to the extent of deluding ourselves that we are God” (103). This advice is needed in the church today and especially for parents, like myself, who are raising children who love sports. We must be able to teach our children how to rightly relate to the sports they play and perhaps even more importantly have the language to teach ourselves how to rightly relate to two of the biggest idols in the church, our children and the sports our children play. Sport is often thought to be a civilized form of war, a domesticated outlet for the pre-programmed genetic struggle for survival in the cultivated terrain of civil society, But, because the state of (original) nature is not war but peace, we can say that this way of seeing things is upside down and back to front. Of course, our fallenness means we are constantly at war with ourselves, which makes war seem primary to our twisted minds. But on a properly Christian reading of creation, war would be much better understood as the a fallen state of sport rather than sport being seen as a domesticated form of war. 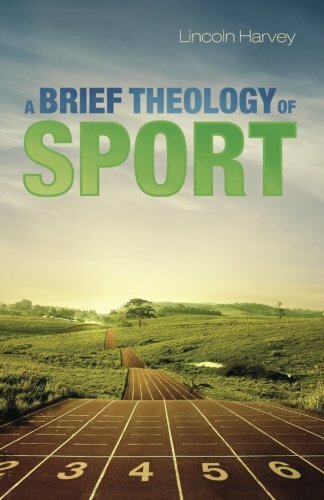 Though I have thought a lot about the ways I engage in sports as a Christian, I have not given as much thought to how I define sport. After reading Harvey’s book, I started to listening to the ways I, and those around me, talk about sports, and war terminology is by far the most commonly used descriptions. Thus, regardless of whether or not I knew it sports as domesticated war is my default definition of sport. Harvey’s book has made me aware of the fundamental ways this definition shapes the way I talk about and engage in sports. It has also made me begin questioning these ideas and changing the ways I think about sports, talk about sports, and engage in sports. In the end, the highest praise I can offer the book is that it has changed the way I engage in a very crucial part of my family’s life. Thus, Harvey’s description of the theological task rings true as he has given “voice to reality by speaking in tune with the event of God’s own self-introduction in Jesus Christ” (xiii). *”Creation may not be serious, but it is not meaningless. Instead, the Church believes that we are created freely out of nothing and for something” (81). **This quick recap cannot do justice to all of Harvey’s ideas. My suggestion is if you find it interesting read the book!